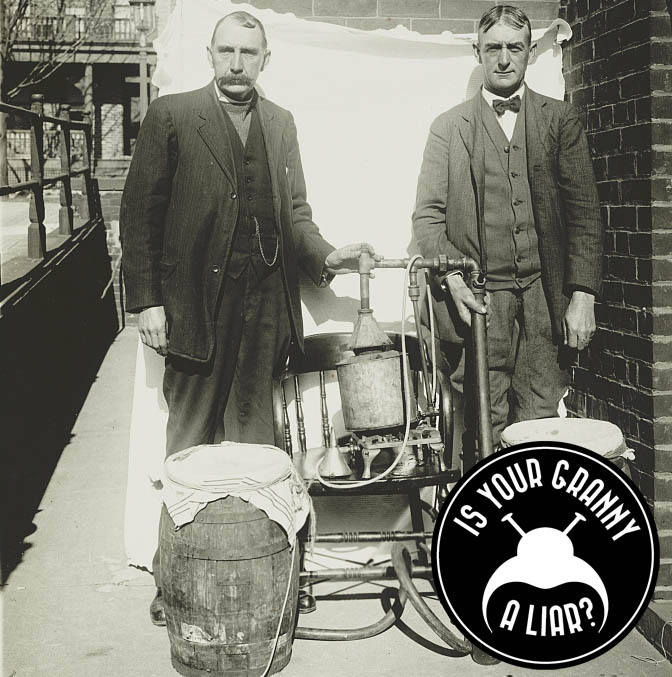 For as long as I have known Andy he has always claimed that his ancestors were bootleggers in Baltimore. The story is that his great-grandmother’s family either owned or worked in a bar during America’s Prohibition in the 1920s when the sale of alcohol was illegal. To be honest, I didn’t believe him because his stories always seem too good to be true. The Eighteenth Amendment banned the sale of alcohol in the United States. Although the law first went into effect on 16 January 1920, the State of Maryland was slow to enforce it. As such, many speakeasies and bootleggers operated throughout the state with minor repercussions, until it was repealed in 1933 with the Twenty-first Amendment. The most recent ancestor that Andy knew about on the alleged bootlegging side of the family was his great-grandmother Genevieve Chrzanowski, who was born in Baltimore, Maryland circa 1912. It is purported that her father and brothers were the ones who were selling liquor, but he wasn’t sure of their names or birth dates. I started by searching records of Andy’s great-grandmother so I could identify her father and brothers. The first document I found was this 1930 Federal Census return that shows eight-year-old Genevieve living with her family in Baltimore. According to the record, her parents were Julian and Bernice Chrzanowski, and they lived at 2312 Boston Street. Julian’s job was listed as a “laborer” in “Wholesale Food”. Note that census records from this year split a person’s profession into two attributes: the first is their “occupation” and the second is their “industry.” The industry category tended to be a broader description and as such it’s not always an exact characterization of a person’s job (especially depending on how the census taker interprets the instructions). Since they lived in a major city, I then checked the Baltimore City Directories to see if I could find more information about Julian’s occupation. The entry for Julian in 1930 simply lists his profession as “soft drinks,” which sounds more than a little suspicious. The entry also shows that he lived and worked at 2312 Boston Street. The 1929 City Directory also listed Julian’s profession as “soft drinks” and the 1928 directory stated he owned a restaurant on Boston Street. Again, the City Directories don’t always give an exact description of a person’s occupation, so the change in the directories between 1928 and 1929 may or may not be significant. Either way, the City Directories seem to be giving some credence to Andy’s family story. At this point, I know what you’re thinking: if these guys were actually bootleggers, they aren’t going to report it to the census taker or the City Directory publishers. That’s why I then checked for more information about Julian in the digital archives of The Baltimore Sun. I searched for the Chrzanowski surname, and I found an article from 18 October 1928 that lists the arrests and convictions of people in Baltimore. What is notable about this article is that it is specifically for convictions of those who broke the Prohibition laws, as opposed to just a generic crime report. From this article, we learn that Julian Chrzanowski was sentenced to 60 days in jail for the manufacture and possession of alcohol in October 1928. “HELD FOR SHOOTING AT DRY AGENTS” The Sun, Baltimore, Maryland, 18 October 1928: 3. The Chrzanowski family still had problems with the police even after the end of Prohibition. 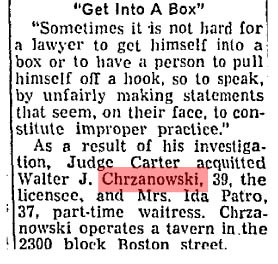 I found another article from The Sun (the prior name of The Baltimore Sun) in 1956 that details how Julian’s son, Walter J. Chrzanowski, was accused of selling liquor to a minor. A 19-year-old girl alleged that Walter and his attorney told her to claim on the witness stand that she used a fake birth certificate to buy alcohol. When she went to testify, she denied using a “rigged” birth certificate and told the judge that she was instructed to lie by Walter and the attorney. As a result, the State’s Attorney was tasked with reviewing the case to get to the bottom of who was telling the truth. Fortunately, as a result of the investigation, Walter was eventually acquitted of these charges. “LAWYER HELD NOT INVOLVED IN TESTIMONY: Judge Exonerates Short In Alleged Perjury Of Witness” The Sun, Baltimore, Maryland, 22 Feb 1957: 40. Despite these issues, the family was able to keep the liquor license at the family bar for many more years. According to this article from 1992, the bar originally opened as “Julian’s Lounge”, and it stayed in the family for three generations. The name was eventually changed to “Numbers” and it was a well-known gay bar in Baltimore. In the early 1990s, however, there were incidents of violence against its mostly gay clientèle and the bar closed. One final note is that knowing the name of the bar also lead me to an interesting piece of ephemera. 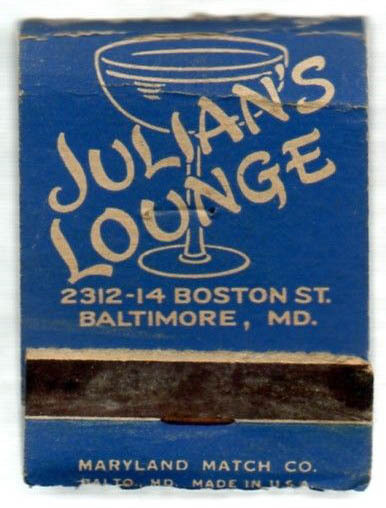 As shown below, I was able to purchase a matchbook from Julian’s Lounge (probably from the 1960s) on eBay as a gift for Andy’s father. I think we have solid evidence that Andy’s granny is NOT a liar. He can now confidently say that he is related to bootleggers who sold illegal alcohol in Baltimore during Prohibition.